Goodridge G-Stop Brake Line Kits are constructed from the finest quality hose, consisting of a PTFE inner and stainless steel overbraid. Replacing OE brake lines with -03 PTFE hose improves brake feel over factory lines, eliminates sponginess, and provides shorter stopping distances and consistent braking in performance applications. The shorter stopping distances and improved pedal response provide safety features as well as performance advantages. All G-Stop lines go through a nine-point quality assurance testing including the materials tensile strength and 3000 psi pressure ratings. 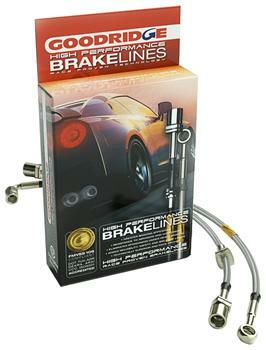 When used with an ABS braking system they virtually eliminate brake pedal “chatter”. All G-Stops conform to FMVSS106-Federal Motor Vehicle Safety Standard- making them DOT compliant and are TUV approved-the German standard that most international regulations follow.